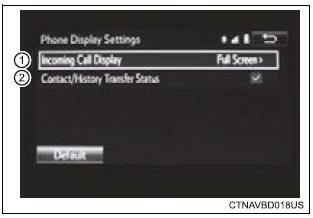 �Full screen�: when a call is received, the hands-free screen is displayed and can be operated on the screen. �Drop-down�: a message is displayed on the upper side of the screen. Set display of the contact/ history transfer completion message on/off.